Taipa Village Cultural Association exclusively presents a pioneering aerial photography exhibition “Surface Revealed” from leading national photographer Chan Hin Io. The exhibition renders a unique vision with the technological approach of drone photography, a relatively new and emerging art form that reveals to the naked eye the grand design of the urban landscape in conjunction with the natural environment. These aerial shots were intentionally framed to capture orthogonal views of the earth’s surface and disclose visual compositions that can turn recognizable eye-level street views into uplifting abstract compositions. Chan Hin Io is one of the most prolific, self-motivated and versatile freelance photographers in the territory, focusing intensely on people, events, and heritage sites, as well as tracking the urban development of his beloved city of Macau. 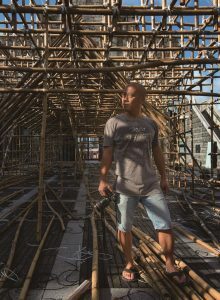 Carrying the same spirit and attitude, last year, he was engaged in a thorough photographic report when super Typhoon Hato struck the peninsula with unprecedented strong winds and flooding. His first solo exhibition at Taipa Village Art Space renders a unique vision with the technological approach of drone photography, a relatively new and emerging art form that reveals to the naked eye the grand design of the urban landscape in conjunction with the natural environment. These aerial shots were intentionally framed to capture orthogonal views of the earth’s surface and disclose visual compositions that can turn recognizable eye-level street views into uplifting abstract compositions. The selection criteria for this exhibition was based on the aesthetic qualities and the plasticity charged in each image as if it was a painting, in detriment to the referential elements of the urban fabric (streets, squares, etc). Some of the most striking compositions depict the new reclamation zones and the highly restricted construction sites on these man-made islands, revealing their colourful stages of land formation and quasi-paradisal locations. Other compositions depict the quotidian life of the inhabitants immersed in their specific surroundings. It is invigorating to observe how each outdoor setting has its own identity, allowing certain ways of interaction, appropriation and ultimately providing a memorable experience of the public space. For instance, the less well-known Hac-Sa beach (literally, black sand beach), the lonesome fisherman at the seashore of Long Chao Kok, the grand feast at Barra Square for the festival of Tin Hau, goddess of the sea, and the dragon boat training season at Nam Van lake. These particular sets of images encapsulate the social dynamics that constitute the pulse of a city. Chan Hin Io, national senior photographer of China, started to study photography in 1996. Among the 2nd Selection of Top Ten Photographers in Guangdong Province, he is also a member of China Photographers Association, member of Guangdong Photographers Association, consultant of Photographic Society of Macao. Chan Hin Io is currently a freelance photographer, with particular interest in capturing Macao’s cityscape in recent years. Some of his works are under the collections in Macao Museum of Art and Archives of Macao.